Google has launched its much anticipated cloud storage service, placing the search giant in direct competition with Dropbox and Microsoft's Skydrive service. Google are offering 5Gb for free, with up to 100Gb on paid plans, allowing users to store any type of file in the cloud and sync it with other devices. 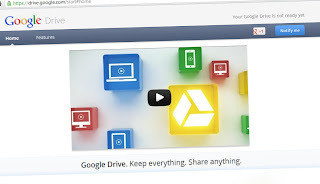 Speculation concerning Google Drive has persisted for years but intensified in recent weeks with leaked screenshots and insider claims. A search on Google this week also showed that the domain address https://drive.google.com/support existed, though at the time it redirected to a generic support page. But late Tuesday the wait was over as Google announced the launch of Google Drive, "a place where you can create, share, collaborate, and keep all of your stuff". Actually the wait isn't quite over as many visitors going to the site found a message saying "Your Google Drive is not ready yet". After registering interest a message then states an email will be sent when access to Google Drive is possible. For Google account holders the online storage will be exciting news, allowing access to files stored in the cloud from any web enabled device. There will no doubt be concerns from some who will raise issues of security and as to how safe one's files are in the cloud, especially after a recent outage experienced by a large number of Gmail users [BBC].